Hikvision's HDTVI kits are perfect for retrofit and new installations where siamese coax and power wiring is in place. 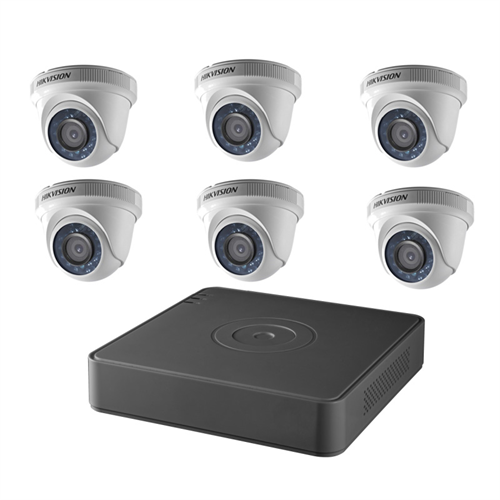 The indoor/outdoor IP66 rated cameras capture high definition 1080p colour during the day and automatically switch to night vision mode at night to capture images in pitch black up to 20m (66ft). The built in infrared LEDs use Smart IR technology to ensure just enough lighting at night without washing out the image. The included DVR uses H.264 compression for extended storage time on the included hard drive. A local HDMI and VGA connection is available for a local display. A network connection allows for network and Internet access via free Hikvision software or the free iOs and Android app. Note: Wire and camera power supplies are not included. Cameras require 12VDC power. Siamese cable is recommended with BNC connections for video and 2.1mm power connections.